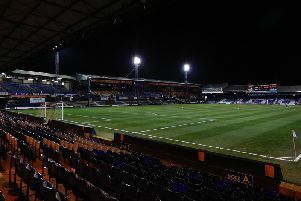 Luton Town chief executive Gary Sweet has labelled delays over the club’s attempts to build a new ground at Power Court as ‘unfathomable’. The Hatters submitted a double proposal for a new 17,500 stadium at the venue along with a mixed use scheme on land adjacent to Junction 10 of the M1, way back in August 2016. It had been hoped that Luton Borough Council would put an officers’ report on the applications before councillors at the start of 2017, but that never materialised and since then, the silence has been deafening, with Town currently left in a state of limbo over their future plans. Writing in his programme notes ahead of last night’s clash with Crawley Town, Sweet said: “We fully understand and appreciate that planning officers must be meticulous in their considerations but we have been very patient, as helpful as any developer could be and have been swift in responding to any questions or challengers. “I’m beginning to find it unfathomable how something so positive and already detailed can take so long. “As we have entered the final third of the season the same two principal goals remain potentially alive for us all; promotion to League One and a receipt of a planning consent by the local council. “On this latter aim, I can only apologise for not giving more updates recently, however, I’m sure you all understand that as we are now in the final technical throes of the process, there is little we can do or say other than wait. “Naturally we are working tirelessly (and sometimes sleeplessly) to respond to the various technical cross-examinations thrown our way which of course we’re able to and happy to respond to. Sweet has urged the council to make their decision by next month, with the club attending a premier real estate event in France, where they can make some real strides in the actual building of the new stadium. He continued: “In March - week commencing 13th to be precise - 2020 will be very well-represented at MIPIM in Cannes (the event where we won two acclaimed architectural awards last year) - an important global property exhibition where partnerships are created and deals are done. “We have politely asked the council to be mindful of the the fact that visiting Cannes at great expense without having a planning decision after 20 months of consideration will create a not insignificant delay in progressing with the project. “Indeed the inability to be able to trade at MIPIM will not only hamper our progress but the progress of the town itself. “It will be incredibly disappointing (and costly) if we were to miss this key timeframe and I have urged our council, as far as I am possibly able, to give us the ammunition to begin the process of making this dream a reality." Meanwhile, Sweet also called on the fans for their continued support, as he added: "Right here, right now for both the development of our town and club, we could be lucky enough to be celebrating two major events this season and you can play a fundamental role.